Three men who distributed hundreds of anti-gay flyers in the west of Amsterdam in October 2016 have been each fined €500 by judges in the Dutch capital. Salahattim Y (31) and Cengis E (31) from The Hague and Erdal A (41) from Rotterdam were all found guilty of insult and inciting discrimination. The public prosecution department had called for sentences of 40 hours community service. It also included a link to a Facebook page focusing on a Romanian couple who were angry their children were taken into care in England and then adopted by a gay couple. The men said at the time their aim had been to start a discussion and that their action fell under freedom of speech legislation. Dutch media suggested at the time the leaflets were the work of supporters of Turkish creationist Harun Yahya. 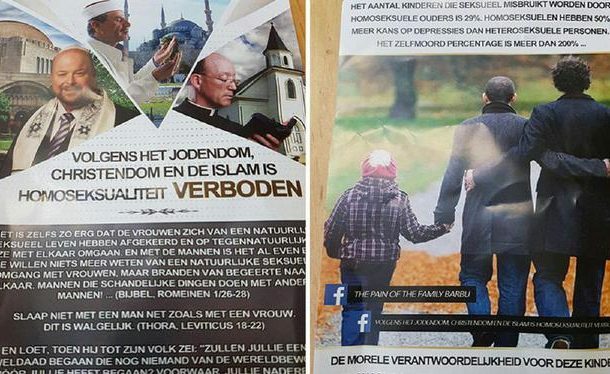 The same quotes and photographs as used on the leaflet can be found on two Dutch Facebook pages interspersed with quotes and films featuring Yahya, who is characterised by his ultra-conservative creationism.